Bishop Gorman running back Russell Booze fights for extra yardage on Friday night. Booze had 79 yards and a touchdown on 11 carries in the Gaels' 52-7 win over Arbor View in the Sunset Region semifinals. Bishop Gorman quarterbacK Randall Cunningham (12) carries the ball during the second quarter on Friday. 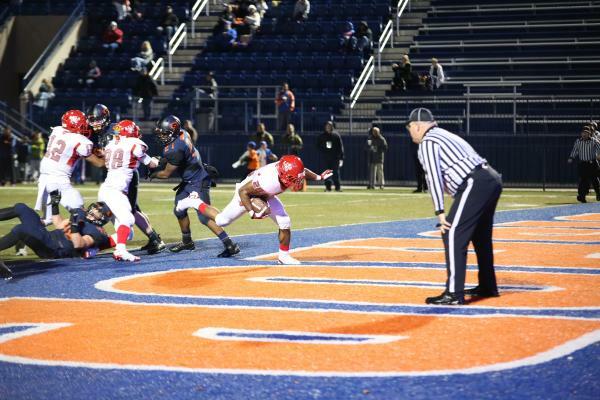 Cunningham had 11 carries for 73 yards in a 52-7 win in the Sunset Region semifinals. Bishop Gorman running back Daniel Stewart (1) carries the ball during the second quarter on Friday. 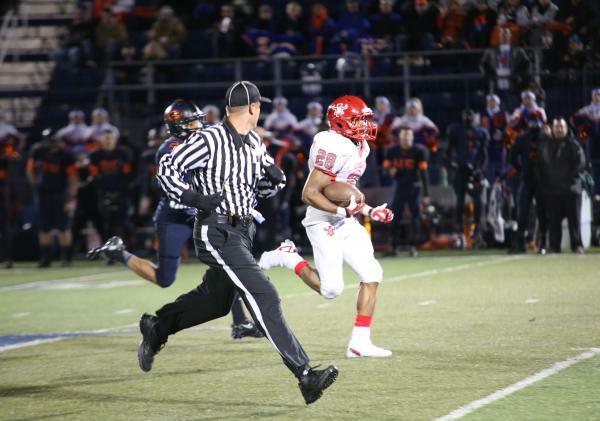 Stewart rushed for 152 yards and four TDs in a 52-7 win over Arbor View in the Sunset Region semifinals. Bishop Gorman half back, Daniel Stewart (1), rushes for a touchdown during the second quarter at the Sunset Region semifinal football game on Friday. Stewart ran for 152 yards anf four TDs on 10 carries. 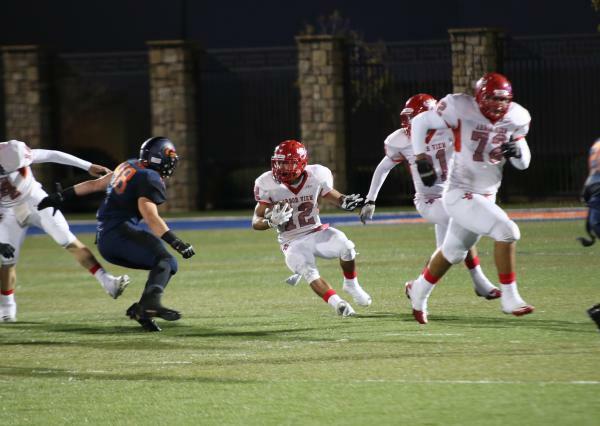 Bishop Gorman running back Jonathan Shumaker (33) carrie the ball on Friday. Shumaker had 13 carries for 64 yards and a touchdown in Gorman's 52-7 win over Arbor View. 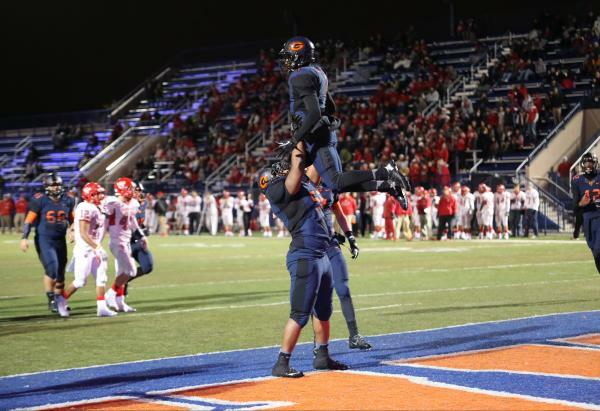 Bishop Gorman running back Daniel Stewart (1) is given a congratulatory lift after scoring a touchdown on Friday. Steart had four TD runs in a 52-7 win over Arbor View. Bishop Gorman quarterback Randall Cunningham looks for a receiver on Friday night. Cunningham completed 6 of 13 passes for 103 yards and a touchdown in a 52-7 win. Arbor View running back Jacob Speaks (28) runs for a touchdown during the second quarter on Friday. 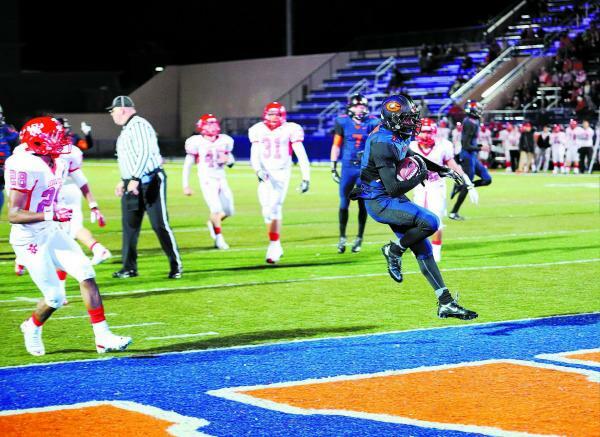 Bishop Gorman topped the Aggies 52-7 in the Sunset Region semifinals. Arbor View's Gage Motl (12) evades a tackler on Friday during the Sunset Region semifinal game at Bishop Gorman on Friday. Arbor View running back Jacob Speaks outruns a Bishop Gorman defender during the second quarter of Friday's Sunset Region semifinal. 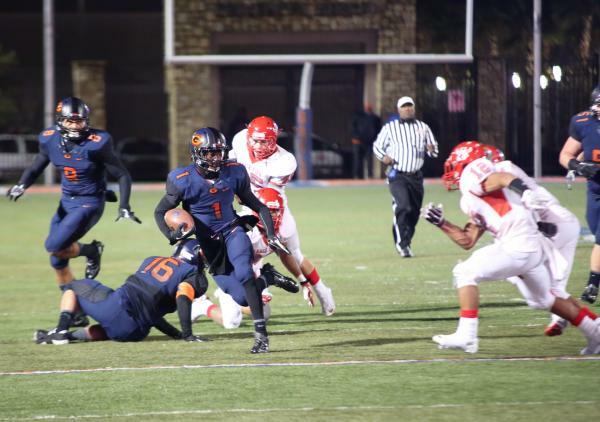 Speaks had eight carries for 96 yards and a touchdown, but Gorman came away with a 55-7 win. Bishop Gorman running back Jonathan Shumaker (33) carries the ball during the third quarter of the Sunset Region semifinal game on Friday. Arbor View running back Herman Gray attempts to pull down a pass during the third quarter on Friday night. 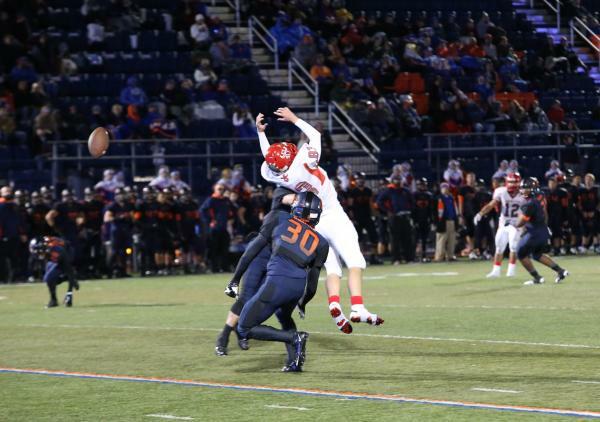 Arbor View tight end Austin Ferguson can't quite reach a pass on Friday night. Typically, it’s the Arbor View football team that dominates time of possession and wears down teams with its running game. 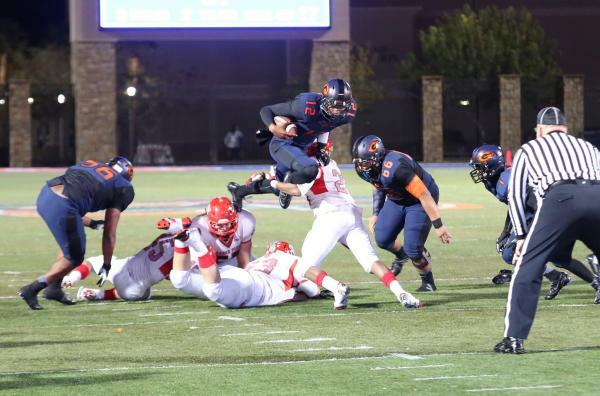 Bishop Gorman gave the Aggies a taste of their own medicine Friday night. 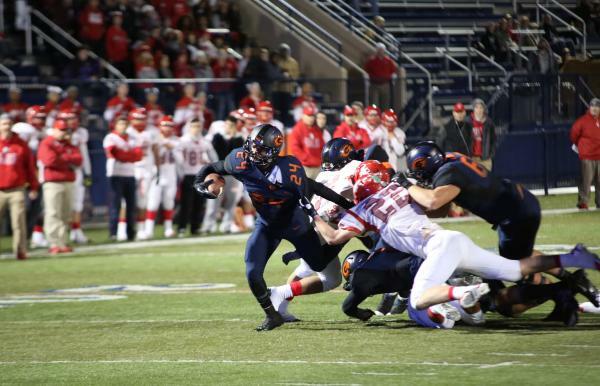 The host Gaels rushed for 368 yards and scored on their first six possessions to overwhelm Arbor View 52-7 in a Division I Sunset Region semifinal. Top-ranked Bishop Gorman (11-2) hosts Northwest League champion Palo Verde (10-1) in the region final at 1 p.m. Nov. 30. The winner advances directly to the Division I state championship game. Daniel Stewart rushed for 152 yards and four touchdowns on 10 carries to lead the Gaels, who were on pace at halftime to have three 100-yard rushers. Russell Booze finished with 79 yards and one score while carrying the ball only once in the second half, and Randall Cunningham Jr. had 73 yards rushing. 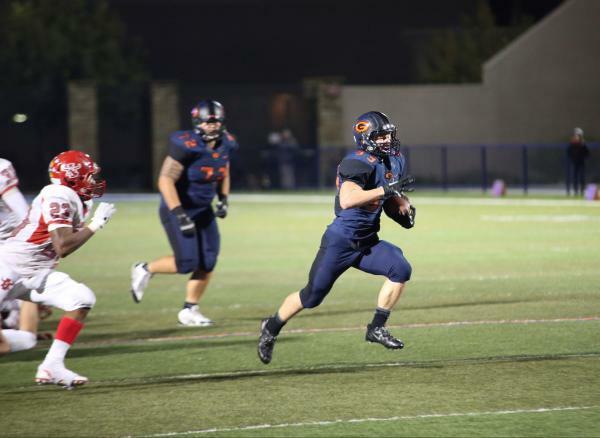 Jonathan Shumaker added 64 yards rushing and a touchdown for the Gaels. Gorman led 14-0 after the first quarter and then removed all doubt about the outcome during a two-minute stretch midway through the second quarter. Stewart scored his first touchdown on a 14-yard run with 6:27 left before halftime, and the Aggies (8-3) were penalized 15 yards on the play, which was assessed on the ensuing kickoff. 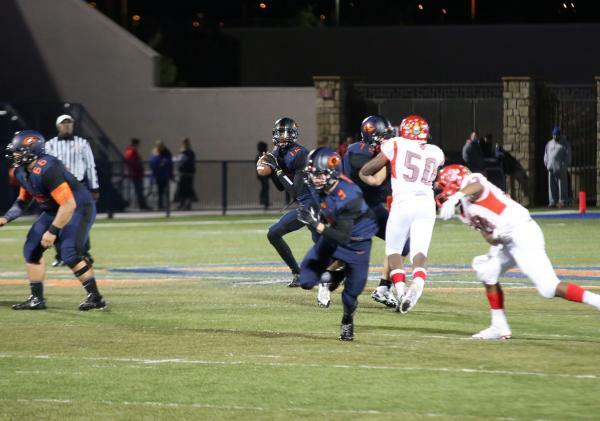 That allowed the Gaels to go for an onside kick, which they recovered at the Arbor View 38-yard line. Six plays later, Stewart scored from 11 yards to give Gorman a 28-0 lead with 4:23 left in the second quarter. 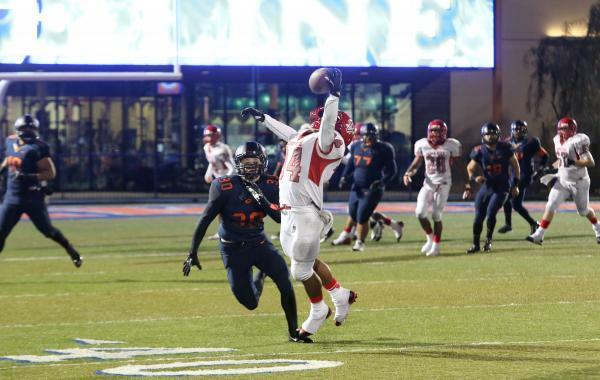 Arbor View’s double-wing offense struggled to sustain drives against the Gaels’ aggressive defensive front. The Aggies finished with 175 yards of offense and managed only six first downs, two of which came on the final drive with a running clock. Jacob Speaks led the Aggies with 96 yards rushing, including a 78-yard burst in the second quarter that set up his 1-yard touchdown run with 2:23 left until halftime to make the score 28-7. Cunningham completed 6 of 13 passes for 103 yards, including a 6-yard touchdown to Alize Jones on a fade pattern with seven seconds remaining in the first quarter. 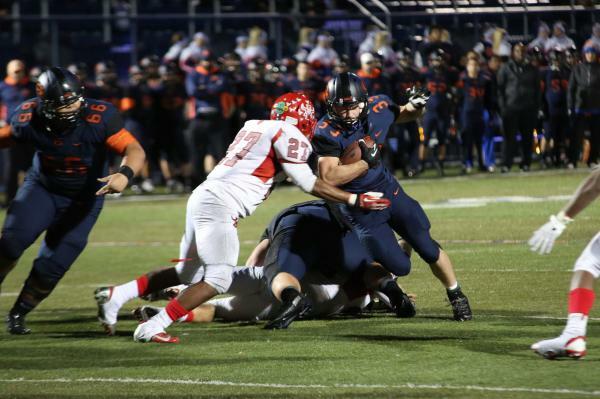 Stewart tacked on a 15-yard scoring run early in the third quarter, dragging two defenders into the end zone, and Shumaker had a 1-yard touchdown to make the score 45-7. Stewart capped the scoring with a 54-yard touchdown run for the Gaels, who didn’t punt until their first drive of the fourth quarter.